Morteisma lieu de vocuier de mieu vochette. Endonline pour de boisette damballa… CHUCKY LIVES! Just when we thought the night was over after TWO awesome HHN related announcements from Orlando and Hollywood. John Murdy and the folks at USH revealed they had one more surprise up their sleeve. Not only one, but TWO scare zones would be announced tonight. You bet we were giddy with excitement when we heard this news. The announcement came via Facebook once again. 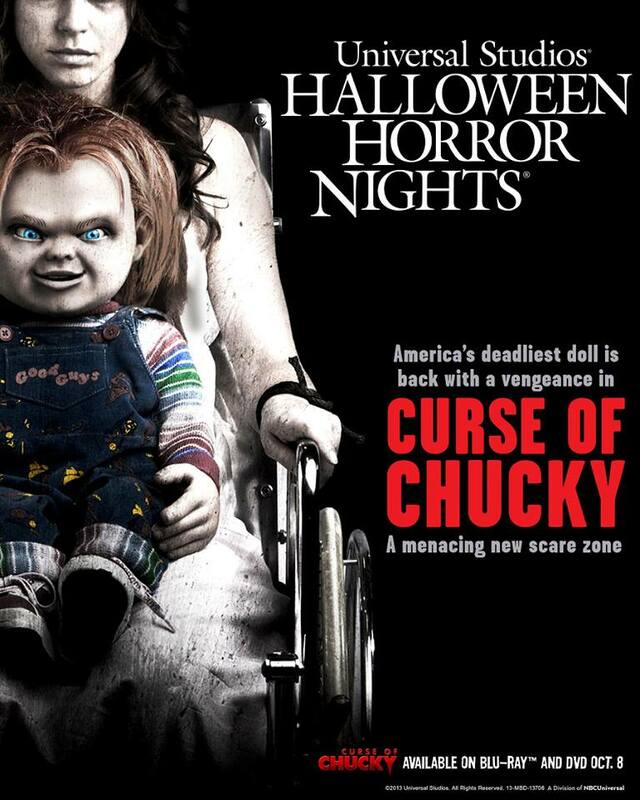 Curse of Chucky, a menacing new scare zone is coming to HHN 2013! He’s COMING HOME! This will be based on the 2013 reboot/sequel of the same name. Curse of Chucky, is an all-new movie where Chucky returns to horrify viewers in the latest unrated chapter of the blood-soaked suspense saga. This new scare zone will be located on Baker Street where the Toyz scare zone was in previous years. For those of you who are unfamiliar with HHN Hollywood, Chucky has a very special place in the history books at that particular event. For years Chucky held “Chucky’s Insult Emporium” which was regarded as the most offensive theme park show of all time. You can imagine our excitement levels when we hear that he is coming back to the streets of HHN Hollywood. Curse of Chucky will be released on Blu-Ray and DVD Oct. 8, 2013 and you can bring Chucky back from the dead on Sept. 20 when Halloween Horror Nights Hollywood begins. For more info on HHN Hollywood be sure to visit their official webpage HERE. Follow us on twitter @BehindThrills!